So, I’ve never been a breakfast bar person. I actually used to hate breakfast all together. Mr McDorkins, though, is a breakfast bar junkie. He is an addict and he needs help. Help, because when you turn one of those scrumptiously decorated labels around, you realize that 1 bar can have 30% of your daily sodium and a massive chunk of sugar!! It’s gross. I’ve been making snack bars for him lately, especially since the cost of these unhealthy bars are about as stupid as the people who decided labeling something that obviously isn’t good for you as healthy. First, I made a homemade twist on Larabars. Neither of us have ever, actually, had a Larabar so I don’t know if I can actually compare what made to the real thing. Super simple…. First thing I do is measure out the dates and toss them in a bowl and cover with water. This softens them and removes the flour/sugar/whatever they put on them to keep them from sticking. I rinse a few times over the course of 5 or so minutes. Once that is done, I put the dates in the processor with the cherries and cinnamon. Pulse until a paste. Scoop into a bowl. Pop the nuts into the processor and pulse until they are chopped, too large and they fall apart a lot easier. Toss those into the bowl, mix and then split in half. I use a piece of plastic wrap for each one, I kind of spoon the mix on and I try to fold the plastic wrap over the bars and shape them while they are wrapped so that I don’t make a massive mess. They go straight into the fridge and usually are eaten within the next day by Mr McDorkin. I think in the time since I’ve started to make them, I’ve had half of one bar. Once they start to warm up they become a bit more crumbly but if you have them cold, they keep shape perfectly. Today, I decided to try something a little different and in a larger batch, rather than 2 at a time. I found this recipe(http://www.food.com/recipe/oatmeal-breakfast-bars-45034) and I put a slightly more crunchy spin on it. 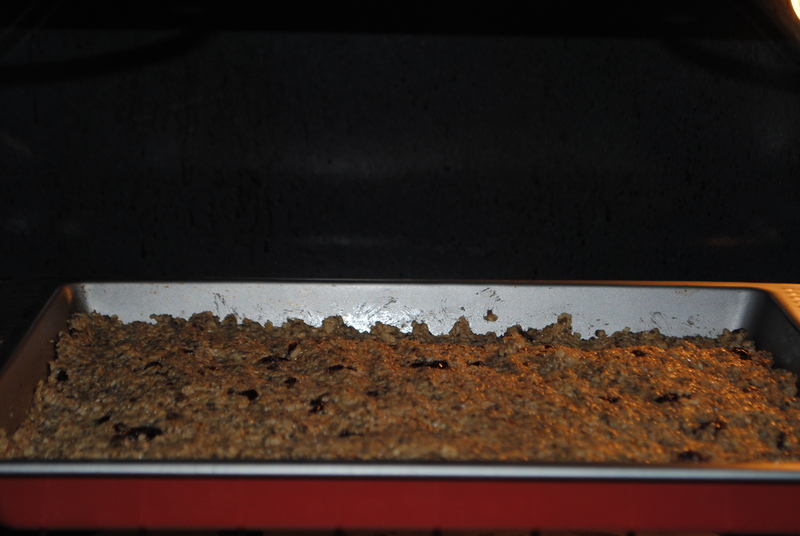 Combine the 3/4 c oats and 1/4 c almond slices in the food process and process until a fine/flour consistency. Once you get the right consistency, pour into a large bowl. Soak your dates like the recipe above if they are dry and place in the processor with whatever fruit you choose. Pulse a few times to just chop the fruit into smaller pieces. Scoop out and into the large bowl. Add all of the other ingredients. I mixed by hand to combine and mixed and mixed and mixed, adding more oats as needed to get a firmer consistency. You want to be able to shape the dough. 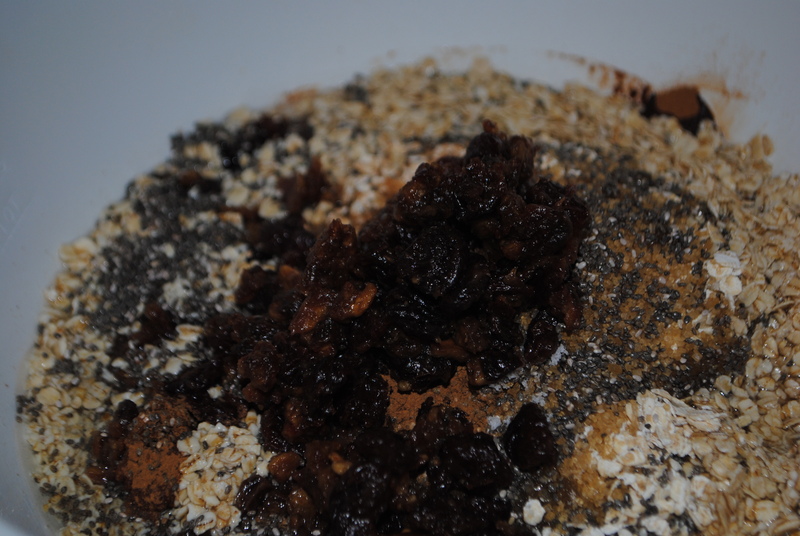 Place your mixture into a pan and flatten out so that it reaches the edges. Pop it straight into the over for about 35 minutes. Once you pull your pan out, cut your bars. I used a pizza cutter and then cleaned up the ends with a butter knife. Let cool completely before removing. Eat. Makes about 12 bars, depending on how you cut them. these smell SO good baking!! OF COURSE, you can take these recipes and put your spin on them. Use YOUR favorite fruits to make them, not mine. I think the best part of recipes if that you can always personalize them and make them your own!! That’s the fun of it, right? Cooking is art, have fun and create. This entry was posted in Food, Uncategorized and tagged bars, breakfast, dried, easy, food, fruit, GF, gluten free, healthy, homemade, larabar, low sodium, oat, oatmeal, on the go, quick, recipe, snack by themcdorkins. Bookmark the permalink.